To make the sweet potato fries, preheat oven to 200°C (400°F). Divide the sweet potato, oil, salt and pepper between 2 large oven trays lined with non-stick baking paper and toss to coat. Cook, turning halfway, for 20 minutes or until golden. While the sweet potato fries are cooking, heat half the oil in a small frying pan over high heat. Add the onion and garlic and cook, stirring, for 4–5 minutes or until softened. Place the onion mixture, peas, kale, mint, oats, egg, flour, lemon rind, chia seeds, salt and pepper in a food processor and pulse until combined. Shape the mixture into 6 patties and freeze for 10 minutes or until firm. Heat the remaining oil in a large non-stick frying pan over medium heat. Cook the patties for 3 minutes each side or until golden brown. Place the tahini and yoghurt in a small bowl and mix to combine. Spread the buns with the tahini mixture. 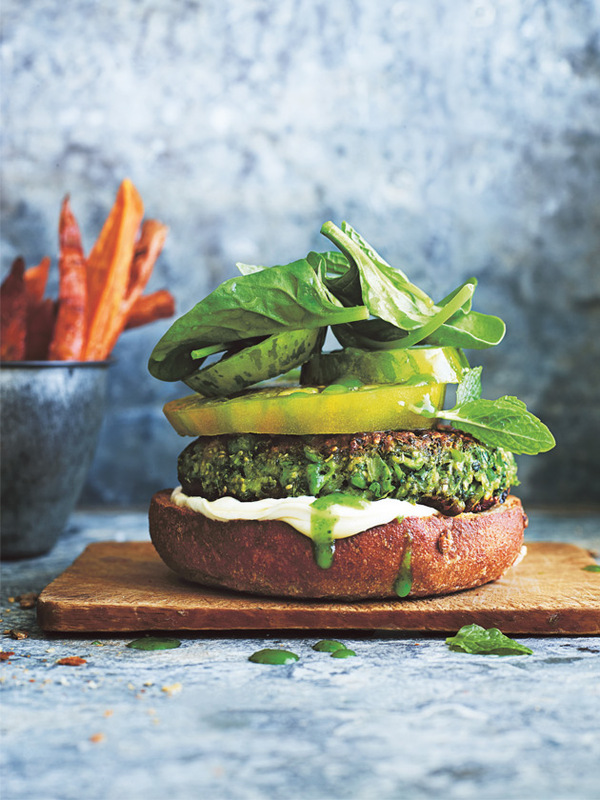 Divide the patties, tomato, spinach, extra mint leaves and Tabasco between the bun halves. Serve with the sweet potato fries. Serves 6. This was delicious! Best burger I’ve made so far. Thanks!